I know that some of you are probably not into learning about history, but it was my favourite subject at school so you’ll have to indulge me. Recently my boss John (Ashfield Cycles) mentioned to me that the first ever women’s bike race in Australia actually took place in Ashfield (in Sydney’s inner west). I must admit that I was a bit dubious at the time so I decided to delve into it a bit more and headed to the Ashfield Library where I found a local publication with a whole chapter dedicated to it. So I won’t bore you with the whole tale, but here’s a few highlights. In February 1888 (that’s 127 years ago) a women’s cycling race was organised at the now defunct Ashfield Recreation Grounds. Ads were placed in The Sydney Morning Herald which listed a two-mile champion race; one, two and three mile handicaps; a half-mile handicap race; and a half-hour tournament all for ‘ladies’, run over three days. 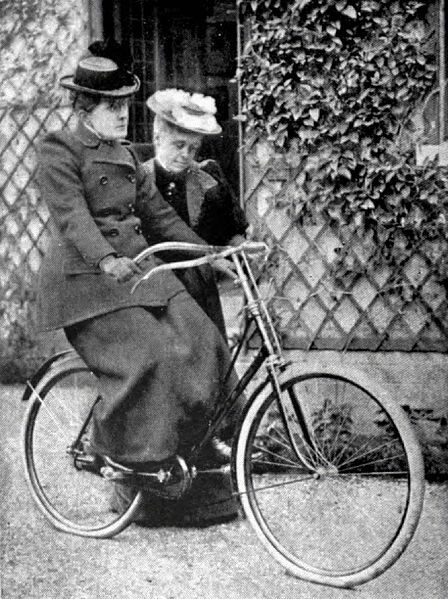 On first reading you might think this was a great step forward for women’s cycling but Alfred Wyburd was actually well known at the time as an organiser of ‘amusements’ and is probable that Wyburd had actually engaged the women, not as competitive sportswomen, but as paid entertainers. According to the author of the article Ann O’Connell it is probable that the women used stage names because searches of indexes and lists suggested they weren’t local, and perhaps belonged to a travelling show or circus troupe. Nonetheless the article suggests that the crowds were entertained and enjoyed the”Ashfield women’s outfits of close fitting knee breeches and long stockings which were risqué for 1888″. It does appear that the event was a once-off which further suggests that it was just entertainment. Although it was just seven years later in 1895 when the Sydney Ladies’ Bicycle Club was formed with nine members at the inaugural meeting. The ‘safety’ bicycle which had smaller, evenly sized wheels and could be made in a cut-down version that was easier for women to ride wearing a long skirt, no doubt contributed to the formation of this club. The club captain Mrs E A Maddock was known as an accomplished rider, having been the first woman to ride overland between Sydney and Melbourne, and between Sydney and Brisbane. She could apparently ride 80 to 90 miles a day without apparent fatigue. And we complain today about rough roads! Imagine how rough the roads would have been on the bone-shaking bike she would have been riding! Quite a woman. I hope you’ve enjoyed your little bit of local Sydney history as much as I’ve enjoyed researching and writing it. Don’t worry Nic, I like history too and found the account fascinating. I wonder what times were recorded?